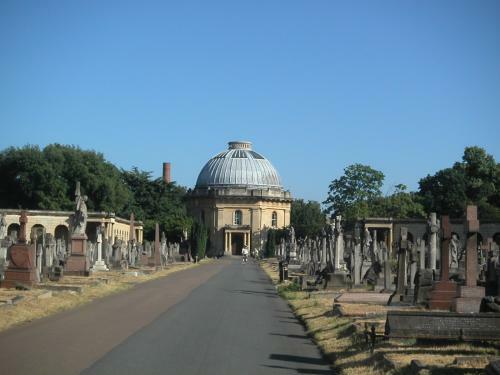 Regular followers will remember that back in May I had an experience which seemed to be directing me to Brompton Cemetery. I got my opportunity to carry out that directive on Friday (19/07/13). 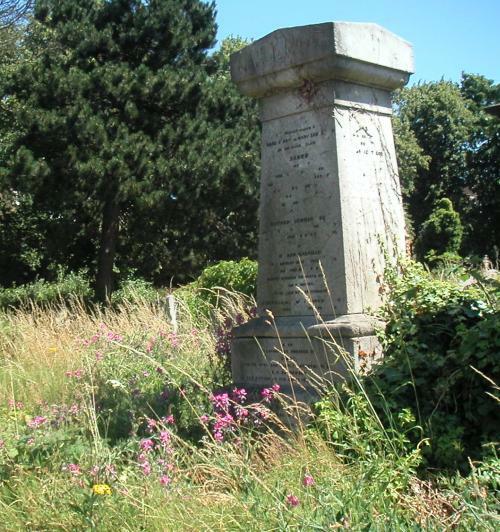 I’d arrange to meet my friend outside West Brompton tube station at 1.15 p.m. but as she was delayed I walked the few yards to the cemetery by myself. I noticed two things almost simultaneously. 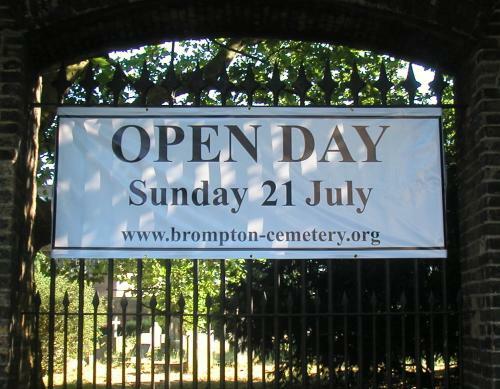 The first was the banner advertising the cemetery’s open day the following Sunday. I wondered who hosted such a day. Whether the residents come out for the day and invite people to experience their small resting space (or in some cases not so small). Which leads me to the second thing I noticed. The vastness of the cemetery. As I stood at the Old Brompton Road end my eyes were drawn to the circular building at the end of a long drive which was flanked by ancient tombstones in all shapes and sizes. I made my way in the scorching sun through the group of what appeared to be street performers. As I wandered further up the drive their laughter and applause became less distinct. I took detours down some of the side streets to the left and to the right, noting that some of the graves down these avenues were somewhat overgrown with long grasses, and sprinkled with vivid purple sweet peas. Some well positioned trees provided welcomed shade, and on one occasion an opportunity to ‘spend a penny’ as there are no facilities in the cemetery. By the time my friend arrived an hour later I’d had a chance to take in some of the more spectacular and unusual edifices, and engage in friendly chatter with a Portuguese man who stopped to talk to me. I found no evidence of the graves of Surrounded by the Enemy or Red Penny, and without a specific map of where they’re buried I could have be wandering around for weeks. The cemetery is 16.4 hectares. We headed to Tesco for some lunch at the Fulham Road entrance, being both a bit peckish by then; but was forced to stop and observe a group of courting pigeons. I’d never noticed before the iridescent green and pink of the male neck feathers, which shimmer and dazzle when inflated to attract the attention of all too often disinterested females. These female pigeons were certainly making their men work for their attention. Makes me think we could learn a thing or two from them. It was lovely to spend time with my friend in person. Even though we speak almost every day on the phone there’s nothing like a face-to-face meeting to rekindle that special friendship energy. 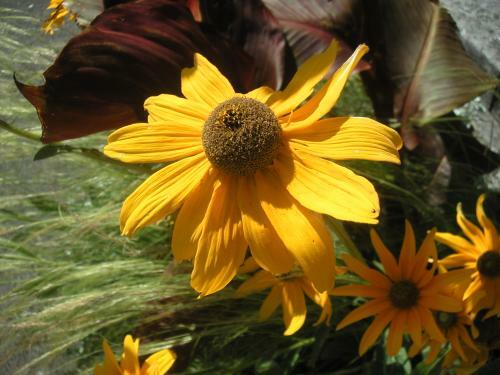 He turned to look at her and scarpered. We marvelled at how he’d held our gazes, looking from one to the other of us as though trying to tell us something we couldn’t quite get. An hour later as we wandered back down one of the side avenues we saw a group of crows. What is the collective noun for crows? They seemed to be having some kind of meeting but dispersed every time someone came close. I’ve only just realised as I write this (five days later) that the day I had the dream there were pigeons trying to get into my window. One meaning of seeing pigeons is getting messages in unusual ways. I looked up foxes and crows. Fox = amongst other things, listen and hear, look and see, sense and feel – trust your senses to guide you. Crow = be very watchful over the next couple of days for any clear omens and signs that will guide your and teach you. With hindsight it wasn’t surprising to see these creatures – given that I was in London for a shamanic workshop!!! DOH! 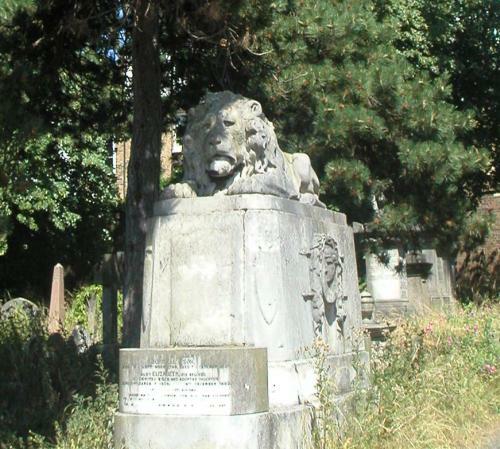 Categories: Stepping stones | Tags: animal guides, Brompton Cemetery, Shamanism | Permalink.